To investigate the chemopreventive mechanisms of 4-Methylthio-3-butenyl isothiocyanate (MTBITC), we analyzed cell viability, cell cycle distribution, and expression levels for cell cycle and apoptosis-related proteins in MTBITC-treated malignant esophageal KYSE510 cells, with and without the reactive oxygen species (ROS) scavenger N-acethyl-L-Cysteine (NAC). MTBITC dose-dependently reduced cell viability and Bcl2 protein expression, while it induced cleavages of caspase-3, caspase-9, and PARP-1, suggesting that reduced cell viability occurred through the mitochondrial apoptotic pathway in KYSE510 cells. In cell cycle distribution analysis, MTBITC (20-40 µM) induced cell cycle arrest at G2/M phase. Furthermore, MTBITC induced Chk1 and Akt phosphorylations and decreased p27 protein expression. Both apoptotic- and cell cycle-related changes induced by MTBITC treatment were abolished by NAC. These results suggest that MTBITC has chemopreventive potential for esophageal carcinogenesis by elimination of cancer cells via induction of mitochondrial apoptotic cell death, G2/M cell cycle arrest, and ROS production. 4-Methylthio-3-butenyl isothiocyanate (MTBITC) extracted from daikon (Raphanus sativus; Japanese white radish) has antimutagenic properties and potential for effective cancer chemoprevention (Nakamura et al., 2001; Nakamura et al., 2008). We have investigated the chemopreventive effect of MTBITC on esophageal cancers, especially esophageal squamous cell carcinoma (ESCC), which is endemic in eastern Asia, including Japan (Ferlay et al., 2015; Yamaji et al., 2008). Several cohort studies have shown that higher consumption of vegetables and fruits is related to a lower incidence of ESCC (Yamaji et al., 2008; Steevens et al., 2011; Freedman et al., 2007). One prospective cohort study in Japan revealed that increased consumption of various vegetables and fruits is associated with an 11% decrease in the incidence of ESCC; in particular, higher intake of cruciferous vegetables decreases the risk of ESCC (Yamaji et al., 2008). Cruciferous vegetables, such as broccoli, brussel sprouts, cabbage, and radishes, are rich in glucosinolates, which are converted to isothiocyanates (ITCs) by the enzymatic action of myrosinase (Hayes et al., 2008). ITCs generated from glucosinolates are effective inhibitors of carcinogenesis, and many studies have evaluated the effects of ITCs on the prevention of various cancers in animals and the associated mechanisms of action in vitro (Xu et al., 2006; Navarro et al., 2011; IARC, 2004). Our previous studies showed that MTBITC may provide chemoprevention against esophageal carcinogenesis in rats and may activate Nrf2, the transcription factor related to cancer prevention in human esophageal cells (Hirata et al., 2018; Suzuki et al., 2016). The inhibitory effect of MTBITC on N-nitrosomethylbenzylamine (NMBA)-induced esophageal carcinogenesis in rats was observed when administered in both the initiation and promotion phases. The multiplicity of esophageal squamous cell papilloma in rats treated with MTBITC during any experimental period, including initiation and promotion phases, was significantly decreased compared to rats treated with NMBA alone (Suzuki et al., 2016). In vitro analysis revealed that Nrf2 and its target genes, such as antioxidative genes and phase II enzymes, were activated in Het-1A cells treated with MTBITC. The level of Nrf2 activation induced by treatment with MTBITC in Het-1A cells was the same extent under the treatment with sulforaphane (SFN), which is the major Nrf2 inducer. This MTBITC-induced gene activation was abolished by N-acethyl-L-Cysteine (NAC) (Hirata et al., 2018). Therefore, it was suggested that MTBITC induces Nrf2 activation in the initiation phase to metabolize the mutagen in normal esophageal cells. While we revealed the possible mechanism of action of MTBIC for esophageal cells in the initiation phase, the mechanisms during the promotion phase in esophageal cancer or in cancer stem cells are unclear. A number of reports have described the chemopreventive effect in malignant cells of isothiocyanates (ITCs), including phenethyl isothiocyanate (PEITC), benzyl isothiocyanate (BITC) and SFN, (Jakubikova et al., 2005; Cheung and Kong, 2010; Wu et al., 2010; Navarro et al., 2011; Mantso et al., 2016). These reports support that the ITCs’ mechanism of action in malignant cells is induction of apoptotic cell death. ITC-induced apoptotic cell death in malignant cells is typically by the mitochondrial apoptotic pathway and involves ROS production. Elevated ROS has been detected in cancer cells, where it is reported to promote progression and over-proliferation (Gorrini et al., 2013; Gundala and Aneja, 2014). Given elevated ROS, cancer cells would be sensitized to oxidative stress-induced cell death than normal cells. Furthermore, it is reported that MTBITC induced apoptotic cell death in the hepatocellular carcinoma cell line, HepG2 (Lamy and Mersch-Sundermann, 2009). However, the apoptotic changes of esophageal cancer cells treated with MTBITC are still unknown. Both cell growth inhibition via cell cycle arrest, and apoptotic cell death via the mitochondrial pathway, are reported to occur in cancer cells (Evan and Vousden, 2001). Cell cycle arrest was reported in cancer cells treated with ITCs, including PEITC, BITC, SFN and allyl isothiocyanate (AITC) (Jakubikova et al., 2005; Ryter et al., 2007; Cheung and Kong, 2010; Navarro et al., 2011). The distribution of cell cycle phases is often determined by the status of p53, which is a regulator of cell proliferation, migration, and cellular specificity. MTBITC treatment of HepG2 cells induced G1/S cell cycle arrest, apoptosis, and an increase in both p53 and p21 protein levels (Lamy and Mersch-Sundermann, 2009). Furthermore, in our previous study of NMBA-induced esophageal carcinoma in rats, we detected p21 protein expression in the esophagus of rats following administration of both NMBA and MTBITC (Suzuki et al., 2016). These results suggest that MTBITC may also induce cell cycle arrest and induction of p21 regulated by p53 to prevent cancer promotion similar to other ITCs. There is no report investigating apoptotic cell death or cell cycle arrest induced by MTBITC treatment in esophageal cancer cells. In the present study, we investigated MTBITC treatment in the esophageal cancer cell line KYSE510 for mechanisms including altered apoptotic cell death and cell cycle arrest. This cell line was established from a well-differentiated stage 3 ESCC and is therefore well suited as a model for MTBITC in ESCC. The several gene abnormalities, deletion of p53, p16, p15 which are relative to cell proliferation, were observed in KYSE510 cell line (Shimada et al., 1992; Tanaka et al., 1996; Tanaka et al., 1997). First, we measured KYSE510 cell viability following treatment with MTBITC. Second, we performed immunoblot to identify key apoptosis factors associated with MTBITC-dependent chemoprevention in KYSE510 cells. Finally, we examined cell cycle distribution in MTBITC-treated KYSE510 cells and immunoblot analysis to confirm the expression level of cell cycle-related proteins. Our results show that ROS generated via MTBITC treatment is important for activation of apoptosis and cell cycle arrest-related proteins, and that cell death and growth suppression are induced by MTBITC in KYSE510 cells. MTBITC was extracted and purified from the root of heirloom varieties (Sabaka and Momoyama) of daikon (Raphanus sativus) as described previously (Nakamura et al., 2001). The purity of the MTBITC was 98.0% and estimated by HPLC (Shimadzu, Kyoto, Japan). NAC and dimethyl sulfoxide (DMSO) were purchased from Sigma-Aldrich (St. Louis, MO, USA). KYSE510 cells were obtained from the Japanese Collection of Research Bioresources (JCRB) Cell Bank (Tanaka et al., 1997; Tanaka et al., 1996; Shimada et al., 1992). KYSE510 cells were cultured in Dulbecco’s Modified Eagle Medium (Life Technologies, Carlsbad, CA, USA) containing 10% fetal bovine serum (Nichirei Bioscience, Tokyo, Japan) and 50 μg/mL gentamicin (Life Technologies). The cells were grown at 37°C in the presence of 5% CO2. The cells were plated on 12-, 24- or 96-well cell culture plates and were allowed to grow for 24 hr. To treat with MTBITC, culture medium containing 0-50 µM MTBITC was added and cells were incubated for 24 hr in the presence and absence of 10 mM NAC. Cells treated with 0.1% DMSO were used as a solvent control (SC). KYSE510 cells were treated with MTBITC (0-50 µM) for 24 hr. The cell viability assay was performed using the CellTiter 96 Aqueous non-radioactive cell proliferation assay kit (Promega, Madison, WI, USA). The absorbance was read at 492 nm on Infinite F50 (Tecan, Männedorf, Switzerland). The data are expressed as a mean percentage of SC, which was set to 100%, (n = 6) ± SDs. For whole cell lysate, MTBITC-treated cells were lysed in RIPA buffer (Thermo Fisher Scientific, Waltham, MA, USA) containing Protease Inhibitor Cocktail (Roche Applied Science, Penzberg, Upper Bavaria, Germany) and PhosSTOP Phosphatase inhibitor cocktail (Roche Applied Science). Samples were centrifuged at 15,000 × g for 15 min, and the resulting supernatants were used. Protein concentrations were determined using the BCA Protein Assay Reagent (Thermo Fisher Scientific). Samples were separated on 10% or Any kD™ Mini-PROTEAN® TGX™ Precast Protein Gels l (BioRad) by electrophoresis and transferred to PVDF membranes (Millipore, Billerica, MA, USA). For detection of target proteins, membranes were incubated with each primary antibody at room temperature for 1 hr. Secondary antibody incubation was performed using horseradish peroxidase-conjugated secondary anti-rabbit or mouse antibodies (GE Healthcare, Little Chalfont, UK) at room temperature for 1 hr. Protein detection was facilitated by chemiluminescence using ECL Prime (GE Healthcare). Primary antibodies against cleaved caspase-9 (Asp330) ([E5Z7N] Rabbit mAb #52873), caspase-9 ([C9] Mouse mAb #9508), cleaved caspase-3 (Asp175) ([5A1E] Rabbit mAb #9664), caspase-3 ([8G10] Rabbit mAb #9665), cleaved poly (ADP-ribose) polymerase 1 (PARP-1) (Asp214) ([D64E10] XP® Rabbit mAb #5625), PARP-1 (#9542), c-IAP1 ([D5G9] Rabbit mAb #7065), Livin ([D61D1] XP® Rabbit mAb #5471), XIAP ([3B6] Rabbit mAb #2045), Bax (#2772), phospho-Chk1 (S345) (#2341), Chk1 (#2345), phospho-Akt (T308; [C31E5E] Rabbit mAb #2965, S473; #9271) and Akt (#9272) were purchased from Cell Signaling Technology (Danvers, MA, USA). Anti-GAPDH ([6C5] sc-32233), Bcl-2 ([C-2] sc-7382) and p27 ([D-2] sc-393305) were purchased from Santa Cruz Biotechnology (Dallas, TX, USA). Cell cycle distribution in KYSE510 cells treated with 40 µM MTBITC was measured using the Cell Cycle Phase Determination Kit according to the manufacturer’s instructions (Cayman Chemical Company, Ann Arbor, MI, USA). Samples were analyzed in FL2 channel of flow cytometer, BC Accuri™ Flow Cytometer (Franklin Lakes, NJ, USA) with a 488 nm excitation laser. Cell cycle phases were determined using FlowJo software (Tree Star Inc., Ashland, OR, USA). All values were expressed as means ± standard deviations (SD). Variance was checked for homogeneity by Bartlett’s procedure. When statistically significant differences were indicated, Dunnett’s Multiple test was employed for comparison between SC and treated groups and Tukey’s multiple test was employed for comparison between all groups. P values less than 0.05 were considered statistically significant in all analyses. In order to evaluate the effect of MTBITC on cell viability in KYSE510 cells, an MTS assay was performed. KYSE510 cells were incubated with media containing MTBITC at 10, 20, 30, 40 or 50 µM for 24 hr. We found that KYSE510 cells treated with MTBITC (20-50 µM) showed a concentration-dependent reduction in cell viability (Fig. 1). The percentages of cell viability for KYSE510 cells were 100 ± 11%, 80 ± 10%, 66 ± 9%, 32 ± 5% and 26 ± 5% at 10, 20, 30, 40 and 50 µM of MTBITC, respectively. Effect of MTBITC on cell viability of KYSE510 cells. KYSE510 cells were treated with MTBITC for 24 hr. At the end of treatment, cell viability was measured using MTS assay. The data are expressed as a percentage of SC treated with 0.1% DMSO, and are the mean ± SDs of six independent cultures. **p < 0.01 compared with SC. In order to investigate whether the cell death induced by MTBITC in KYSE510 cells is caused by apoptosis, we evaluated the protein levels of cleaved caspases 9, 3 and PARP, which are upregulated during apoptosis, by western blotting analysis. Elevated levels of cleaved caspase-9, cleaved caspase-3 and cleaved PARP protein were observed in samples that had been treated with 20 to 40 µM MTBITC (Fig. 2A). Congruently, decreased inhibitors of apoptosis protein, c-IAP1, XIAP and Livin were also observed (Fig. 2B). We also investigated expression of mitochondrial apoptotic proteins Bcl-2 and Bax in KYSE510 cells treated with MTBITC. 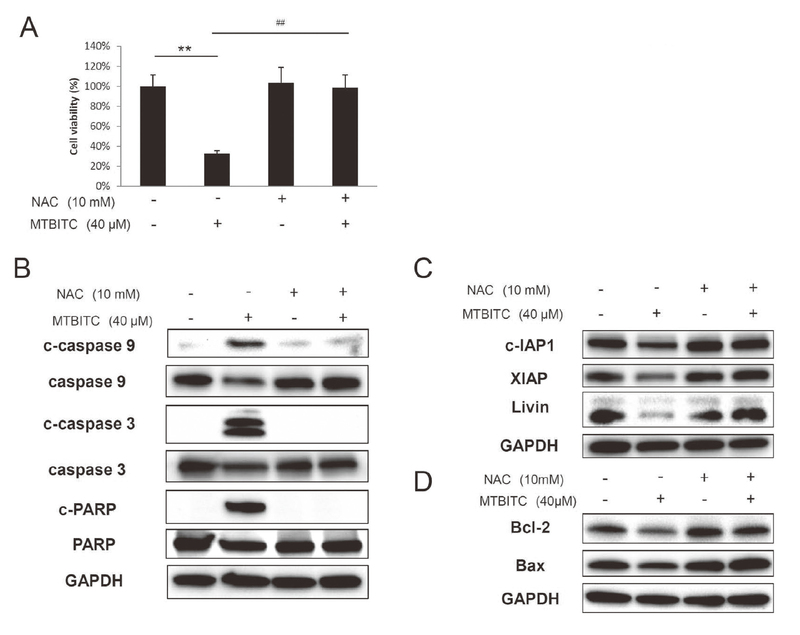 Although increased expression of pro-apoptotic Bax was not observed, consistent with mitochondrial apoptosis activation, pathway antagonist Bcl2 was decreased in a dose-dependent manner (Fig. 2C). MTBITC-induced mitochondrial apoptotic cell death proteins in KYSE510 cells. (A) Western blot analysis of caspase family activation in KYSE510 cells treated with MTBITC (0, 20, 30, 40 μM) for 24 hr. (B) Expression of apoptosis inhibitor proteins in KYSE510 cells treated with MTBITC (0, 20, 30, 40 μM) for 24 hr. (C) Expression of Bcl2 and Bax, which are antagonists or activators of mitochondrial apoptotic cell death, in KYSE510 cells treated with MTBITC (0, 20, 30, 40 μM) for 24 hr. To investigate the role of ROS production in MTBITC-induced apoptosis, we tested the effect of NAC, an ROS scavenger, on cell viability and protein expression in KYSE510 cells treated with MTBITC. We found that NAC recovered cell viability reduced by 40 μM MTBITC (Fig. 3A). In addition, NAC treatment completely abolished protein cleavages of caspase-9, caspase-3 and PARP induced by MTBITC (Fig. 3B). Further, NAC treatment also rescued MTBITC-induced decreases of all inhibitors of apoptosis proteins tested (cIAP, XIAP and Livin), as well as a decrease of Bcl2 (Fig. 3C, D). MTBITC-induced ROS production mediates apoptotic cell death in KYSE510 cells. (A) Viability of KYSE510 cells treated with 40 µM MTBITC with or without 10 mM NAC for 24 hr. Each value is the mean ± SD of six independent cultures. **p < 0.01 compared with SC. ##p < 0.01 compared with MTBITC alone group. (B) Western blot analysis of caspase family activation in KYSE510 cells treated with 40 µM MTBITC with or without NAC for 24 hr. (C) Expression of apoptosis inhibitor in KYSE510 cells treated with 40 μM MTBITC with or without NAC for 24 hr. (D) Expression of Bcl2 and Bax, which are related to mitochondrial apoptotic cell death, in KYSE510 cells treated with 40 μM MTBITC with or without NAC for 24 hr. To confirm the effect of MTBITC on cell cycle progression, we determined the cell cycle distribution of KYSE510 cells treated with MTBITC. Decreased G1 phase and increased G2/M phase were observed by MTBITC treatment of KYSE510 cells (Fig. 4). To further investigate whether this cell cycle alteration was caused by ROS production, we analyzed the effect of NAC treatment on cell cycle distribution in MTBITC-treated KYSE510 cells and observed that the alteration induced by MTBITC was reversed by NAC co-treatment (Fig. 4). Analysis of cell cycle distribution in KYSE510 cells treated with MTBITC. (A) Cell cycle distribution in KYSE510 cells treated with 40 μM MTBITC with or without NAC for 24 hr, by flow cytometry following propidium iodide staining of DNA. (B) Ratio of cell cycle distribution in KYSE510 cells treated with 40 μM MTBITC with or without NAC for 24 hr. *p < 0.05, **p < 0.01 compared with SC. ##p < 0.01 compared with MTBITC alone group. To investigate how MTBITC modulates cell cycle regulatory proteins via ROS production, we analyzed protein fluctuation in KYSE510 cells treated with both MTBITC and NAC by western blot analysis. In KYSE510 cells treated with MTBITC, we observed several dose-dependent changes in protein expression including: a decrease in p27, a protein which induces cell cycle arrest including G2/M phase (Fig. 5A), a decrease in Akt phosphorylation at S473 and T308, which down-regulates p27 protein expression (Fig. 5B), and an increase in Chk1 phosphorylation, which works as a G2/M checkpoint (Fig. 5C). Finally, these changes were each abolished by NAC co-treatment (Fig. 5A, B, C). Expression of cell cycle checkpoint proteins in KYSE510 cells treated with MTBIC. (A) Western blot analysis of p27 protein levels in KYSE510 cells treated with 40 μM MTBITC with or without NAC for 24 hr. 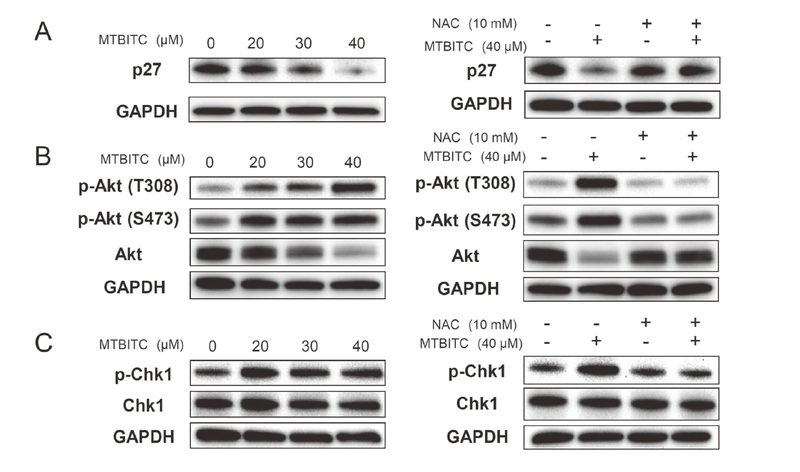 (B) Analysis of Akt phosphorylation in KYSE510 cells treated with 40 μM MTBITC with or without NAC for 24 hr. (C) Analysis of Chk1 phosphorylation in KYSE510 cells treated with 40 μM MTBITC with or without NAC for 24 hr. 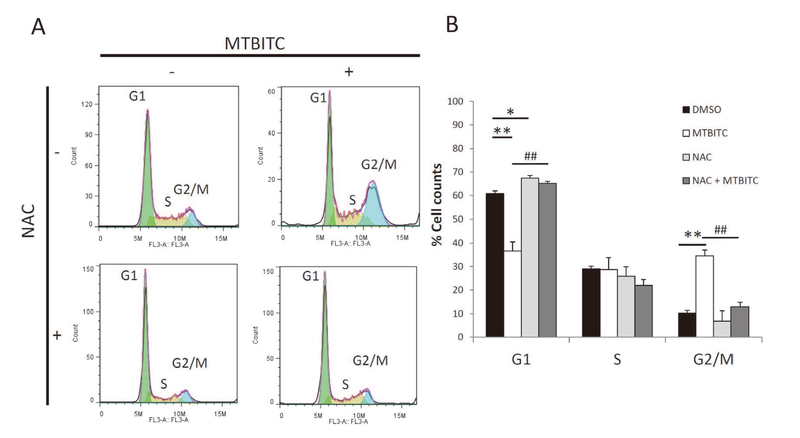 In this study, we revealed that MTBITC induces apoptotic cell death via mitochondrial apoptotic signaling and G2/M cell cycle arrest in human esophageal cancer cells. Furthermore, these cytotoxic changes may occur by MTBITC-induced ROS. Our previous study showed that MTBITC induces ROS in normal human esophageal Het-1A cells, and indicated that ROS induced by MTBITC activates the Nrf2-KEAP1 pathway to maintain cell homeostasis (Hirata et al., 2018). MTBITC has the capability to produce ROS similar to other ITCs. In the present study, although we could not directly detect ROS in KYSE510 cells treated with MTBITC, we did observe that NAC, an ROS scavenger, completely abolished MTBITC-induced cytotoxic changes in KYSE510 cells, which suggests that MTBITC also induces ROS in KYSE510 cells. Several reports regarding ITCs showed that ITCs have an anti-proliferative effect, such as induction of apoptosis in cancer cells, due to ROS production (Schumacker, 2006; Trachootham et al., 2006; Zhu et al., 2014). Because cancer cells already exhibit higher ROS levels than normal cells, further elevation of ROS by treatment with ITCs can eliminate cancer cells by increasing ROS levels to a lethal threshold concentration which would not be sufficient to trigger cell death in normal cells (Trachootham et al., 2009). Therefore, with a specific level of ROS induction, it might be possible to selectively eliminate cancer cells without triggering cell death in normal cells. Although we have not pinpointed the MTBITC concentration that induces cell death cancer esophageal cells but not normal esophageal cells, the effective MTBITC concentration should be revealed under appropriate conditions to compare cell death between normal cells and cancer cells. One mechanism of cell death induced by MTBITC treatment might be via the mitochondrial apoptotic pathway. MTBITC may induce cell death via ROS production in KYSE510 cells. Excessive increase in exogenous ROS in cells induces disruption of mitochondrial membrane potential which leads to the apoptotic pathway. In this study, MTBITC treatment led to a decrease in Bcl2 protein, as well as increases in cleaved caspases-9, 3 and PARP-1 in KYSE510 cells. Furthermore, MTBITC treatment reduced inhibitor of apoptosis proteins, c-IAP1, XIAP and Livin, in these cells. These results indicate that MTBITC induces the mitochondrial apoptotic pathway in KYSE510 cells. Moreover, NAC completely abolished the changes induced by MTBITC treatment. Therefore, these apoptotic changes were possibly driven by ROS production in KYSE510 cells. Other ITCs, such as PEITC and SFN, also induced apoptosis via ROS production and the mitochondrial apoptotic pathway (Cheung and Kong, 2010; Wu et al., 2010; Navarro et al., 2011). We suggest that MTBITC has the ability to induce apoptotic cell death via ROS production, similar to other ITCs. Another important change induced by MTBITC treatment may be cell cycle arrest. In the present study, we show that changes in cell cycle distribution are a result of MTBITC treatment in KYSE510 cells. With MTBITC treatment, cell cycle population at G1 phase decreases, while G2/M phase significantly increases, compared to controls, indicating G2/M arrest. We reveal p27 as a potential cellular mechanism of the cell cycle arrest induced by MTBITC treatment, an inhibitor of cell cycle progression into G1 phase similar to p21, which decreases in a dose-dependent manner. Furthermore, we show that Akt, a downstream effector of phosphoinositide 3-kinase (PI3K) and the direct regulator of p27, is phosphorylated in KYSE510 cells treated with MTBITC. Therefore, MTBITC inhibits p27 protein expression via the PI3K/Akt signaling pathway in KYSE510 cells. While Akt is phosphorylated by treatment with MTBITC, decreased protein level of total Akt was observed. It is reported that proteasome-dependent degradation of Akt occurred simultaneously with its phosphorylation by stimulation with platelet-derived growth factor and insulin-like growth factor-1 (Adachi et al., 2003). As well as these growth factors, MTBITC might also induce reduction of total Akt protein in association with phosphorylation. In addition to inhibition of p27 protein levels, MTBITC treatment increased phosphorylation of Chk1 in KYSE510 cells in a dose-dependent manner. Chk1 is the pivotal factor in cell cycle progression and Chk1 phosphorylation by ATR is essential for cell cycle arrest at G2/M phase upon DNA damage (Capasso et al., 2002; Bo et al., 2014). These results indicate that MTBITC induces G2/M cell cycle arrest via decreases in p27 and phosphorylated Chk1 in KYSE510 cells. Similar to apoptotic cell death, these changes in protein expression are induced by MTBITC and are recovered by NAC treatment. Therefore, G/2M cell cycle arrest in KYSE510 cells might occur via increased ROS by MTBITC treatment as is the case with apoptotic cell death. To investigate the involvement of p53 in apoptosis and cell cycle arrest induced by MTBITC, we also measured the protein level of p53 by western blotting in KYSE510 cell treated with MTBITC. However, changes of p53 protein levels were not detected in KYSE510 cells treated with MTBITC (Data not shown). The reason that p53 changes were not observed may be due to the character of KYSE510 cells. The KYSE510 cell line was established from a well-differentiated ESCC. Some reports describe dysfunction in p53 in KYSE510 cells which have mutation in p53 (Tanaka et al., 1996; Li et al., 2005). In addition to p53, p21, which is regulated by p53 and related to cell cycle arrest, was also not induced in KYSE510 cells treated with MTBITC. These results suggest that p53 and p21 are not induced by MTBITC treatment in KYSE510 cells, although the relationship between p53 status and apoptotic cell death and cell cycle arrest were reported in hepatocellular cells treated with MTBITC (Lamy and Mersch-Sundermann, 2009). In that report, the intensity of G2/M arrest induced by MTBITC-treatment was in the order: p53 null cells > p53 mutated cells > p53 wild type cells. Therefore, in KYSE510 cells, which have mutated p53, G2/M cell cycle arrest induced by MTBITC-treatment could be evoked via the Akt-p27 pathway, independent of p53. 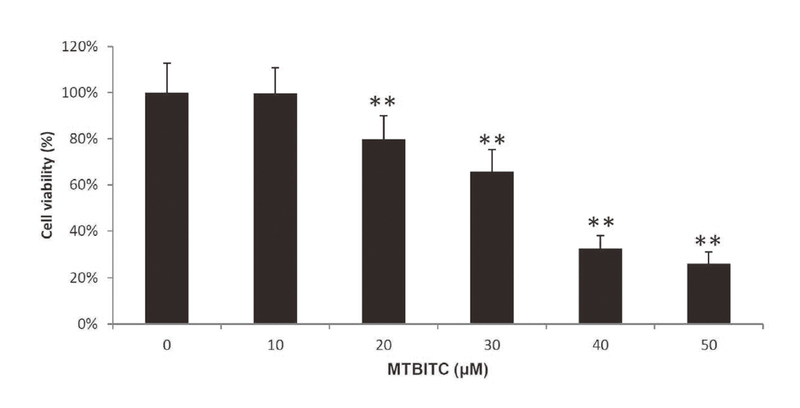 In our previous study, we investigated the chemopreventive effects of MTBITC on rat esophageal carcinogenesis, induced by NMBA, with MTBITC administration in the initiation or promotion phases (Suzuki et al., 2016). Our study on the effect of MTBITC on esophageal carcinogenesis suggests that MTBITC activates Nrf2 to prevent mutagenesis induced by esophageal carcinogens, such as NMBA, via ROS generation in the initiation phase. In addition, MTBITC has the potential to eliminate cancer cells via induction of apoptosis and cell cycle arrest via ROS generation in the promotion phase. Regarding Nrf2, as it is reported cell cytotoxicity induced by methylseleninic acid which has chemopreventive effect on cancer was involvement of miR200a via Nrf2-KEAP1 pathway in KYSE510 cells (Liu et al., 2015), further investigation will be required to reveal the mechanism of action of MTBITC on KYSE510 cells. Moreover, we also tested for toxic effects of MTBITC on rat urinary bladder for 14 days, and found none when administered at the low dose (10 mg/kg BW/ day), relevant as a chemopreventive agent (Suzuki et al., 2016, Okamura et al., 2013, Suzuki et al., 2017). Human intake of ITCs from food such as cruciferous vegetables is estimated to be 50 mg/day per person in the UK (Wattenberg et al., 1985). Therefore, it is expected that like other ITCs, MTBITC has a chemopreventive effect, and toxic effects may be minimal at chemopreventive doses. In conclusion, we reveal that decreased cell viability induced by MTBITC in KYSE510 cells occurs as a result of mitochondrial apoptotic cell death and G2/M cell cycle arrest. We suggest that MTBITC has the ability to kill and stop the growth of cancer cells by induction of apoptosis and cell cycle arrest. Further investigation is required to reveal the chemopreventive effects of MTBITC on carcinogenesis. If an effective dose is established, MTBITC could be useful for tumor inhibition. We thank Dr. R. Sawada and Dr. K. Kono at Division of Cell-Based Therapeutic Products, National Institute of Health Sciences for providing us with experimental facilities in this work. Tadashi Hirata is an employee of Japan Tobacco. Inc., Kanagawa, Japan. Isamu Suzuki is an employee of BoZo Research Center Inc., Shizuoka, Japan. The authors declare no conflicts of interest associated with this manuscript. Adachi, M., Katsumura, K.R., Fujii, K., Kobayashi, S., Aoki, H. and Matsuzaki, M. (2003): Proteasome-dependent decrease in Akt by growth factors in vascular smooth muscle cells. FEBS Lett., 554, 77-80. Bo, S., Hui, H., Li, W., Hui, L., Hong, X., Lin, D., Dai, W.X., Wu, Y.H., Ai, X.H., Hao, J. and Qi, S. (2014): Chk1, but not Chk2, is responsible for G2/M phase arrest induced by diallyl disulfide in human gastric cancer BGC823 cells. Food Chem. Toxicol., 68, 61-70. Capasso, H., Palermo, C., Wan, S., Rao, H., John, U.P., O’Connell, M.J. and Walworth, N.C. (2002): Phosphorylation activates Chk1 and is required for checkpoint-mediated cell cycle arrest. J. Cell Sci., 115, 4555-4564. Cheung, K.L. and Kong, A.N. (2010): Molecular targets of dietary phenethyl isothiocyanate and sulforaphane for cancer chemoprevention. AAPS J., 12, 87-97. Evan, G.I. and Vousden, K.H. (2001): Proliferation, cell cycle and apoptosis in cancer. Nature, 411, 342-348. Ferlay, J., Soerjomataram, I., Dikshit, R., Eser, S., Mathers, C., Rebelo, M., Parkin, D.M., Forman, D. and Bray, F. (2015): Cancer incidence and mortality worldwide: sources, methods and major patterns in GLOBOCAN 2012. Int. J. Cancer, 136, E359-E386. Freedman, N.D., Park, Y., Subar, A.F., Hollenbeck, A.R., Leitzmann, M.F., Schatzkin, A. and Abnet, C.C. (2007): Fruit and vegetable intake and esophageal cancer in a large prospective cohort study. Int. J. Cancer, 121, 2753-2760. Gorrini, C., Harris, I.S. and Mak, T.W. (2013): Modulation of oxidative stress as an anticancer strategy. Nat. Rev. Drug Discov., 12, 931-947. Gundala, S.R. and Aneja, R. (2014): Piper betel leaf: a reservoir of potential xenohormetic nutraceuticals with cancer-fighting properties. Cancer Prev. Res. (Phila. ), 7, 477-486. Hayes, J.D., Kelleher, M.O. and Eggleston, I.M. (2008): The cancer chemopreventive actions of phytochemicals derived from glucosinolates. Eur. J. Nutr., 47 (Suppl 2), 73-88. Hirata, T., Cho, Y.M., Suzuki, I., Toyoda, T., Akagi, J.I., Nakamura, Y., Numazawa, S. and Ogawa, K. (2018): 4-Methylthio-3-butenyl isothiocyanate mediates nuclear factor (erythroid-derived 2)-like 2 activation by regulating reactive oxygen species production in human esophageal epithelial cells. Food Chem. Toxicol., 111, 295-301. Jakubikova, J., Bao, Y. and Sedlak, J. (2005): Isothiocyanates induce cell cycle arrest, apoptosis and mitochondrial potential depolarization in HL-60 and multidrug-resistant cell lines. Anticancer Res., 25, 3375-3386. Lamy, E. and Mersch-Sundermann, V. (2009): MTBITC mediates cell cycle arrest and apoptosis induction in human HepG2 cells despite its rapid degradation kinetics in the in vitro model. Environ. Mol. Mutagen., 50, 190-200. Li, W.D., Wang, M.J., Ding, F., Yin, D.L. and Liu, Z.H. (2005): Cytotoxic effect of a non-peptidic small molecular inhibitor of the p53-HDM2 interaction on tumor cells. World J. Gastroenterol., 11, 2927-2931. Liu, M., Hu, C., Xu, Q., Chen, L., Ma, K., Xu, N. and Zhu, H. (2015): Methylseleninic acid activates Keap1/Nrf2 pathway via up-regulating miR-200a in human oesophageal squamous cell carcinoma cells. Biosci. Rep., 35, e00256. Mantso, T., Sfakianos, A.P., Atkinson, A., Anestopoulos, I., Mitsiogianni, M., Botaitis, S., Perente, S., Simopoulos, C., Vasileiadis, S., Franco, R., Pappa, A. and Panayiotidis, M.I. (2016): Development of a Novel Experimental In Vitro Model of Isothiocyanate-induced Apoptosis in Human Malignant Melanoma Cells. Anticancer Res., 36, 6303-6309. Nakamura, Y., Iwahashi, T., Tanaka, A., Koutani, J., Matsuo, T., Okamoto, S., Sato, K. and Ohtsuki, K. (2001): 4-(Methylthio)-3-butenyl isothiocyanate, a principal antimutagen in daikon (Raphanus sativus; Japanese white radish). J. Agric. Food Chem., 49, 5755-5760. Nakamura, Y., Nakamura, K., Asai, Y., Wada, T., Tanaka, K., Matsuo, T., Okamoto, S., Meijer, J., Kitamura, Y., Nishikawa, A., Park, E.Y., Sato, K. and Ohtsuki, K. (2008): Comparison of the glucosinolate-myrosinase systems among daikon (Raphanus sativus, Japanese white radish) varieties. J. Agric. Food Chem., 56, 2702-2707. Navarro, S.L., Li, F. and Lampe, J.W. (2011): Mechanisms of action of isothiocyanates in cancer chemoprevention: an update. Food Funct., 2, 579-587. Okamura, T., Umemura, T., Inoue, T., Tasaki, M., Ishii, Y., Nakamura, Y., Park, E.Y., Sato, K., Matsuo, T., Okamoto, S., Nishikawa, A. and Ogawa, K. (2013): Chemopreventive effects of 4-methylthio-3-butenyl Isothiocyanate (Raphasatin) but not curcumin against pancreatic carcinogenesis in hamsters. J. Agric. Food Chem., 61, 2103-2108. Ryter, S.W., Kim, H.P., Hoetzel, A., Park, J.W., Nakahira, K., Wang, X. and Choi, A.M. (2007): Mechanisms of cell death in oxidative stress. Antioxid. Redox Signal., 9, 49-89. Schumacker, P.T. (2006): Reactive oxygen species in cancer cells: live by the sword, die by the sword. Cancer Cell, 10, 175-176. Shimada, Y., Imamura, M., Wagata, T., Yamaguchi, N. and Tobe, T. (1992): Characterization of 21 newly established esophageal cancer cell lines. Cancer, 69, 277-284. Steevens, J., Schouten, L.J., Goldbohm, R.A. and van den Brandt, P.A. (2011): Vegetables and fruits consumption and risk of esophageal and gastric cancer subtypes in the Netherlands Cohort Study. Int. J. Cancer, 129, 2681-2693. Suzuki, I., Cho, Y.M., Hirata, T., Toyoda, T., Akagi, J.I., Nakamura, Y., Park, E.Y., Sasaki, A., Nakamura, T., Okamoto, S., Shirota, K., Suetome, N., Nishikawa, A. and Ogawa, K. (2016): 4-Methylthio-3-butenyl isothiocyanate (raphasatin) exerts chemopreventive effects against esophageal carcinogenesis in rats. J. Toxicol. Pathol., 29, 237-246. Suzuki, I., Cho, Y.M., Hirata, T., Toyoda, T., Akagi, J.I., Nakamura, Y., Sasaki, A., Nakamura, T., Okamoto, S., Shirota, K., Suetome, N., Nishikawa, A. and Ogawa, K. (2017): Toxic effects of 4-methylthio-3-butenyl isothiocyanate (Raphasatin) in the rat urinary bladder without genotoxicity. J. Appl. Toxicol., 37, 485-494. Tanaka, H., Shibagaki, I., Shimada, Y., Wagata, T., Imamura, M. and Ishizaki, K. (1996): Characterization of p53 gene mutations in esophageal squamous cell carcinoma cell lines: increased frequency and different spectrum of mutations from primary tumors. Int. J. Cancer, 65, 372-376. Tanaka, H., Shimada, Y., Imamura, M., Shibagaki, I. and Ishizaki, K. (1997): Multiple types of aberrations in the p16 (INK4a) and the p15(INK4b) genes in 30 esophageal squamous-cell-carcinoma cell lines. Int. J. Cancer, 70, 437-442. Trachootham, D., Alexandre, J. and Huang, P. (2009): Targeting cancer cells by ROS-mediated mechanisms: a radical therapeutic approach? Nat. Rev. Drug Discov., 8, 579-591. Trachootham, D., Zhou, Y., Zhang, H., Demizu, Y., Chen, Z., Pelicano, H., Chiao, P.J., Achanta, G., Arlinghaus, R.B., Liu, J. and Huang, P. (2006): Selective killing of oncogenically transformed cells through a ROS-mediated mechanism by beta-phenylethyl isothiocyanate. Cancer Cell, 10, 241-252. Wattenberg, L.W., Hanley, A.B., Barany, G., Sparnins, V.L., Lam, L.K. and Fenwick, G.R. (1985): Inhibition of carcinogenesis by some minor dietary constituents. Int. Symp. Princess Takamatsu Cancer Res. Fund, 16, 193-203. Wu, X., Zhu, Y., Yan, H., Liu, B., Li, Y., Zhou, Q. and Xu, K. (2010): Isothiocyanates induce oxidative stress and suppress the metastasis potential of human non-small cell lung cancer cells. BMC Cancer, 10, 269. Xu, C., Yuan, X., Pan, Z., Shen, G., Kim, J.H., Yu, S., Khor, T.O., Li, W., Ma, J. and Kong, A.N. (2006): Mechanism of action of isothiocyanates: the induction of ARE-regulated genes is associated with activation of ERK and JNK and the phosphorylation and nuclear translocation of Nrf2. Mol. Cancer Ther., 5, 1918-1926. Yamaji, T., Inoue, M., Sasazuki, S., Iwasaki, M., Kurahashi, N., Shimazu, T. and Tsugane, S.; Japan Public Health Center-based Prospective Study Group. (2008): Fruit and vegetable consumption and squamous cell carcinoma of the esophagus in Japan: the JPHC study. Int. J. Cancer, 123, 1935-1940. Zhu, C., Hu, W., Wu, H. and Hu, X. (2014): No evident dose-response relationship between cellular ROS level and its cytotoxicity--a paradoxical issue in ROS-based cancer therapy. Sci. Rep., 4, 5029.